110:0.1 THE ENDOWMENT OF imperfect beings with freedom entails inevitable tragedy, and it is the nature of the perfect ancestral Deity to universally and affectionately share these sufferings in loving companionship. 110:0.2 As far as I am conversant with the affairs of a universe, I regard the love and devotion of a Thought Adjuster as the most truly divine affection in all creation. The love of the Sons in their ministry to the races is superb, but the devotion of an Adjuster to the individual is touchingly sublime, divinely Fatherlike. The Paradise Father has apparently reserved this form of personal contact with his individual creatures as an exclusive Creator prerogative. And there is nothing in all the universe of universes exactly comparable to the marvelous ministry of these impersonal entities that so fascinatingly indwell the children of the evolutionary planets. 110:1.2 I wish it were possible for me to help evolving mortals to achieve a better understanding and attain a fuller appreciation of the unselfish and superb work of the Adjusters living within them, who are so devoutly faithful to the task of fostering man’s spiritual welfare. These Monitors are efficient ministers to the higher phases of men’s minds; they are wise and experienced manipulators of the spiritual potential of the human intellect. These heavenly helpers are dedicated to the stupendous task of guiding you safely inward and upward to the celestial haven of happiness. These tireless toilers are consecrated to the future personification of the triumph of divine truth in your life everlasting. They are the watchful workers who pilot the God-conscious human mind away from the shoals of evil while expertly guiding the evolving soul of man toward the divine harbors of perfection on far-distant and eternal shores. The Adjusters are loving leaders, your safe and sure guides through the dark and uncertain mazes of your short earthly career; they are the patient teachers who so constantly urge their subjects forward in the paths of progressive perfection. They are the careful custodians of the sublime values of creature character. I wish you could love them more, co-operate with them more fully, and cherish them more affectionately. 110:2.1 When Thought Adjusters indwell human minds, they bring with them the model careers, the ideal lives, as determined and foreordained by themselves and the Personalized Adjusters of Divinington, which have been certified by the Personalized Adjuster of Urantia. Thus they begin work with a definite and predetermined plan for the intellectual and spiritual development of their human subjects, but it is not incumbent upon any human being to accept this plan. You are all subjects of predestination, but it is not foreordained that you must accept this divine predestination; you are at full liberty to reject any part or all of the Thought Adjusters’ program. It is their mission to effect such mind changes and to make such spiritual adjustments as you may willingly and intelligently authorize, to the end that they may gain more influence over the personality directionization; but under no circumstances do these divine Monitors ever take advantage of you or in any way arbitrarily influence you in your choices and decisions. The Adjusters respect your sovereignty of personality; they are always subservient to your will. 110:2.5 You as a personal creature have mind and will. 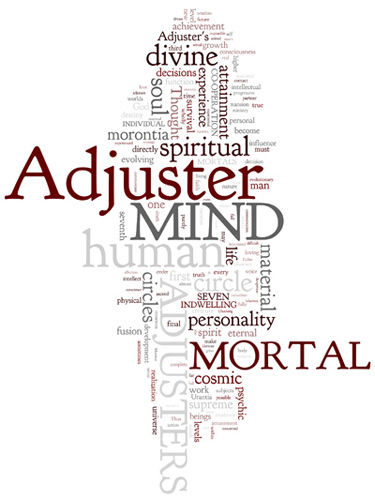 The Adjuster as a prepersonal creature has premind and prewill. If you so fully conform to the Adjuster’s mind that you see eye to eye, then your minds become one, and you receive the reinforcement of the Adjuster’s mind. Subsequently, if your will orders and enforces the execution of the decisions of this new or combined mind, the Adjuster’s prepersonal will attains to personality expression through your decision, and as far as that particular project is concerned, you and the Adjuster are one. Your mind has attained to divinity attunement, and the Adjuster’s will has achieved personality expression. 110:2.6 To the extent that this identity is realized, you are mentally approaching the morontia order of existence. Morontia mind is a term signifying the substance and sum total of the co-operating minds of diversely material and spiritual natures. Morontia intellect, therefore, connotes a dual mind in the local universe dominated by one will. And with mortals this is a will, human in origin, which is becoming divine through man’s identification of the human mind with the mindedness of God. 110:3.3 When we speak of an Adjuster’s success or failure, we are speaking in terms of human survival. Adjusters never fail; they are of the divine essence, and they always emerge triumphant in each of their undertakings. 110:3.5 Confusion, being puzzled, even sometimes discouraged and distracted, does not necessarily signify resistance to the leadings of the indwelling Adjuster. Such attitudes may sometimes connote lack of active co-operation with the divine Monitor and may, therefore, somewhat delay spiritual progress, but such intellectual emotional difficulties do not in the least interfere with the certain survival of the God-knowing soul. Ignorance alone can never prevent survival; neither can confusional doubts nor fearful uncertainty. Only conscious resistance to the Adjuster’s leading can prevent the survival of the evolving immortal soul. 110:4.5 There exists a vast gulf between the human and the divine, between man and God. The Urantia races are so largely electrically and chemically controlled, so highly animallike in their common behavior, so emotional in their ordinary reactions, that it becomes exceedingly difficult for the Monitors to guide and direct them. You are so devoid of courageous decisions and consecrated co-operation that your indwelling Adjusters find it next to impossible to communicate directly with the human mind. Even when they do find it possible to flash a gleam of new truth to the evolving mortal soul, this spiritual revelation often so blinds the creature as to precipitate a convulsion of fanaticism or to initiate some other intellectual upheaval which results disastrously. Many a new religion and strange “ism” has arisen from the aborted, imperfect, misunderstood, and garbled communications of the Thought Adjusters. 110:5.1 Do not confuse and confound the mission and influence of the Adjuster with what is commonly called conscience; they are not directly related. Conscience is a human and purely psychic reaction. It is not to be despised, but it is hardly the voice of God to the soul, which indeed the Adjuster’s would be if such a voice could be heard. Conscience, rightly, admonishes you to do right; but the Adjuster, in addition, endeavors to tell you what truly is right; that is, when and as you are able to perceive the Monitor’s leading. 110:5.3 During the slumber season the Adjuster attempts to achieve only that which the will of the indwelt personality has previously fully approved by the decisions and choosings which were made during times of fully wakeful consciousness, and which have thereby become lodged in the realms of the supermind, the liaison domain of human and divine interrelationship. 110:5.4 While their mortal hosts are asleep, the Adjusters try to register their creations in the higher levels of the material mind, and some of your grotesque dreams indicate their failure to make efficient contact. The absurdities of dream life not only testify to pressure of unexpressed emotions but also bear witness to the horrible distortion of the representations of the spiritual concepts presented by the Adjusters. Your own passions, urges, and other innate tendencies translate themselves into the picture and substitute their unexpressed desires for the divine messages which the indwellers are endeavoring to put into the psychic records during unconscious sleep. 110:5.5 It is extremely dangerous to postulate as to the Adjuster content of the dream life. The Adjusters do work during sleep, but your ordinary dream experiences are purely physiologic and psychologic phenomena. Likewise, it is hazardous to attempt the differentiation of the Adjusters’ concept registry from the more or less continuous and conscious reception of the dictations of mortal conscience. These are problems which will have to be solved through individual discrimination and personal decision. But a human being would do better to err in rejecting an Adjuster’s expression through believing it to be a purely human experience than to blunder into exalting a reaction of the mortal mind to the sphere of divine dignity. Remember, the influence of a Thought Adjuster is for the most part, though not wholly, a superconscious experience. 110:5.6 In varying degrees and increasingly as you ascend the psychic circles, sometimes directly, but more often indirectly, you do communicate with your Adjusters. But it is dangerous to entertain the idea that every new concept originating in the human mind is the dictation of the Adjuster. More often, in beings of your order, that which you accept as the Adjuster’s voice is in reality the emanation of your own intellect. This is dangerous ground, and every human being must settle these problems for himself in accordance with his natural human wisdom and superhuman insight. 110:5.7 The Adjuster of the human being through whom this communication is being made enjoys such a wide scope of activity chiefly because of this human’s almost complete indifference to any outward manifestations of the Adjuster’s inner presence; it is indeed fortunate that he remains consciously quite unconcerned about the entire procedure. He holds one of the highly experienced Adjusters of his day and generation, and yet his passive reaction to, and inactive concern toward, the phenomena associated with the presence in his mind of this versatile Adjuster is pronounced by the guardian of destiny to be a rare and fortuitous reaction. And all this constitutes a favorable co-ordination of influences, favorable both to the Adjuster in the higher sphere of action and to the human partner from the standpoints of health, efficiency, and tranquillity. 2. Soulevolution. The emergence of the morontia soul indicates the extent and depth of circle mastery. 110:6.13The seventh circle. This level is entered when human beings develop the powers of personal choice, individual decision, moral responsibility, and the capacity for the attainment of spiritual individuality. This signifies the united function of the seven adjutant mind-spirits under the direction of the spirit of wisdom, the encircuitment of the mortal creature in the influence of the Holy Spirit, and, on Urantia, the first functioning of the Spirit of Truth, together with the reception of a Thought Adjuster in the mortal mind. Entrance upon the seventh circle constitutes a mortal creature a truly potential citizen of the local universe. 110:6.14The third circle. The Adjuster’s work is much more effective after the human ascender attains the third circle and receives a personal seraphic guardian of destiny. While there is no apparent concert of effort between the Adjuster and the seraphic guardian, nonetheless there is to be observed an unmistakable improvement in all phases of cosmic achievement and spiritual development subsequent to the assignment of the personal seraphic attendant. When the third circle is attained, the Adjuster endeavors to morontiaize the mind of man during the remainder of the mortal life span, to make the remaining circles, and achieve the final stage of the divine-human association before natural death dissolves the unique partnership. 110:6.15The first circle. The Adjuster cannot, ordinarily, speak directly and immediately with you until you attain the first and final circle of progressive mortal achievement. This level represents the highest possible realization of mind-Adjuster relationship in the human experience prior to the liberation of the evolving morontia soul from the habiliments of the material body. Concerning mind, emotions, and cosmic insight, this achievement of the first psychic circle is the nearest possible approach of material mind and spirit Adjuster in human experience. 110:6.16 Perhaps these psychic circles of mortal progression would be better denominated cosmic levels—actual meaning grasps and value realizations of progressive approach to the morontia consciousness of initial relationship of the evolutionary soul with the emerging Supreme Being. And it is this very relationship that makes it forever impossible fully to explain the significance of the cosmic circles to the material mind. These circle attainments are only relatively related to God-consciousness. A seventh or sixth circler can be almost as truly God-knowing—sonship conscious—as a second or first circler, but such lower circle beings are far less conscious of experiential relation to the Supreme Being, universe citizenship. The attainment of these cosmic circles will become a part of the ascenders’ experience on the mansion worlds if they fail of such achievement before natural death. 110:6.17 The motivation of faith makes experiential the full realization of man’s sonship with God, but action, completion of decisions, is essential to the evolutionary attainment of consciousness of progressive kinship with the cosmic actuality of the Supreme Being. Faith transmutes potentials to actuals in the spiritual world, but potentials become actuals in the finite realms of the Supreme only by and through the realization of choice-experience. But choosing to do the will of God joins spiritual faith to material decisions in personality action and thus supplies a divine and spiritual fulcrum for the more effective functioning of the human and material leverage of God-hunger. Such a wise co-ordination of material and spiritual forces greatly augments both cosmic realization of the Supreme and morontia comprehension of the Paradise Deities. 110:6.22 The great days in the individual careers of Adjusters are: first, when the human subject breaks through into the third psychic circle, thus insuring the Monitor’s self-activity and increased range of function (provided the indweller was not already self-acting); then, when the human partner attains the first psychic circle, and they are thereby enabled to intercommunicate, at least to some degree; and last, when they are finally and eternally fused. 110:7.9 While the voice of the Adjuster is ever within you, most of you will hear it seldom during a lifetime. Human beings below the third and second circles of attainment rarely hear the Adjuster’s direct voice except in moments of supreme desire, in a supreme situation, and consequent upon a supreme decision.